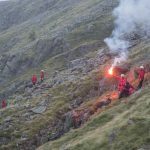 Incident Details: A male paraglider crash-landed at the edge of Gategill, where he then fell approximately 12 metres down a crag into the gill. He suffered serious multiple injuries. 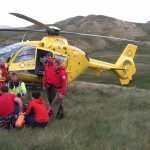 The Team was called to assist the Great North Air Ambulance crew, who were treating the patient at the scene, to evacuate him. But after assessing the situation, it was decided that it would be safer for all concerned to request the assistance of the Coastguard helicopter to winch the casualty from the difficult location. Whilst waiting for the S92 from Prestwick, Team members assisted the Air ambulance crew to splint the casualty, and then place him in a Tyromont winching bag. Once Rescue 999 arrived, the patient was then winched out, and flown down to the Air Ambulance for further assessment and transfer to the other aircraft. He was then flown to the Royal Victoria Infirmary in Newcastle. 11 Team members – 2 hours 19 minutes.